With the stripes on the Be Of Good Cheer DSP looking similar to candy cane stripes, I couldn't resist this shadow effect. The Holiday Collection is great as it coordinates with the Scentsational Season stamp set. I like, too, how it can be used solo. I simply framed the striped DSP with Stampin Dimensional Adhesive and then the Stampin Dimensional on the outside corners. 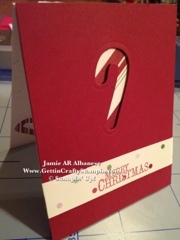 I layered the floating front on the Naturals White card. 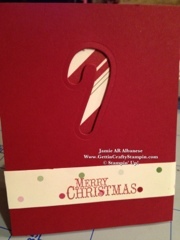 I used the cut out candy cane on the back (not to waste such a cute lil cut out). 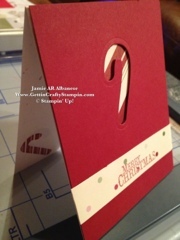 I then couldn't resist and I did stamp the Chock Full Of Cheer candy cane on the inside of the card. The polka dot sheet is from Be Of Good Cheer as well. 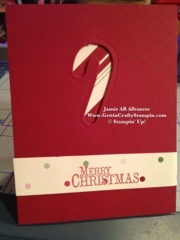 I cut clean strips at 1-1/2" and then I wanted the Chock-Gull of Cheer stamp set's Merry Christmas sentiment. 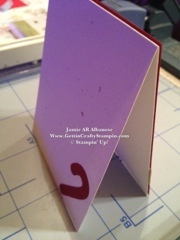 I stamped that with Cherry Cobbler ink. 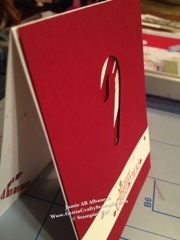 SNAIL adhesive creates a great, elegant and clean looking card. Minimal style isn't my style but I LOVE this look! What do you think?? Thank you for looking, sharing and leaving a comment!